Jehovah Jireh. “God provides.” But how? For whom? And, most urgently, when? "Trusting in God” is an easy catchphrase for believers, but Dr. Cornelius Quek claims that many Christians haven’t actually experienced what it means to actively, wholeheartedly, uncomplainingly give their financial security and daily needs to God. For anyone in need who cognitively knows that God provides financially but lacks experiential proof, this book presents the opportunity to understand God’s care in a whole new light while being inspired by Cornelius’s own testimonies of God’s miraculous provision. Dr. Cornelius goes beyond superficial speculation about God and money to prove that the key to our provision is in the past: God doesn’t just provide—He has already provided. 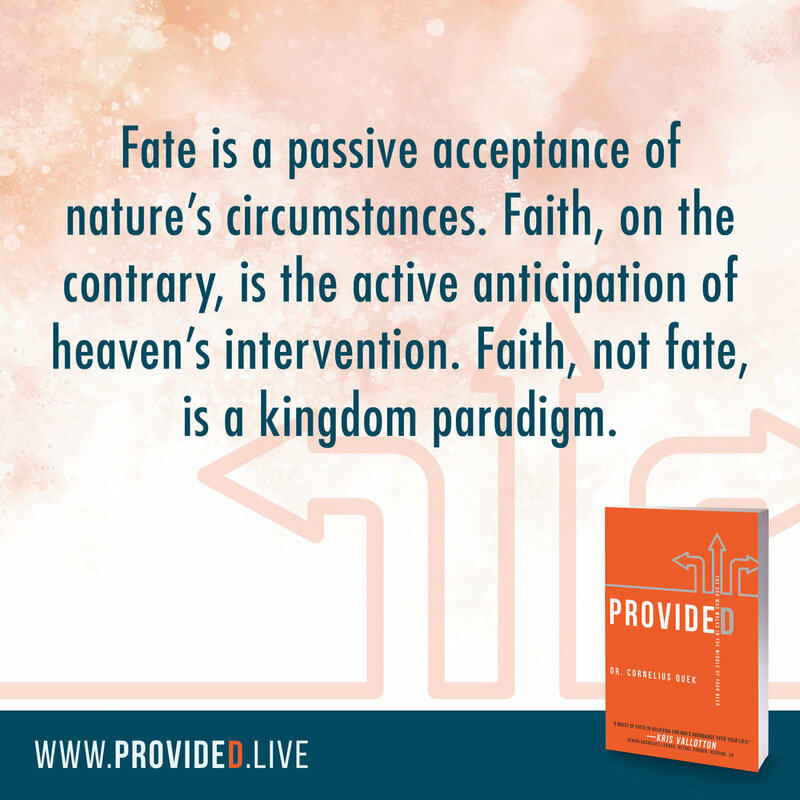 From heaven’s perspective, provision is a done deal. It’s the Christian’s current reality, not just a good idea for the future. 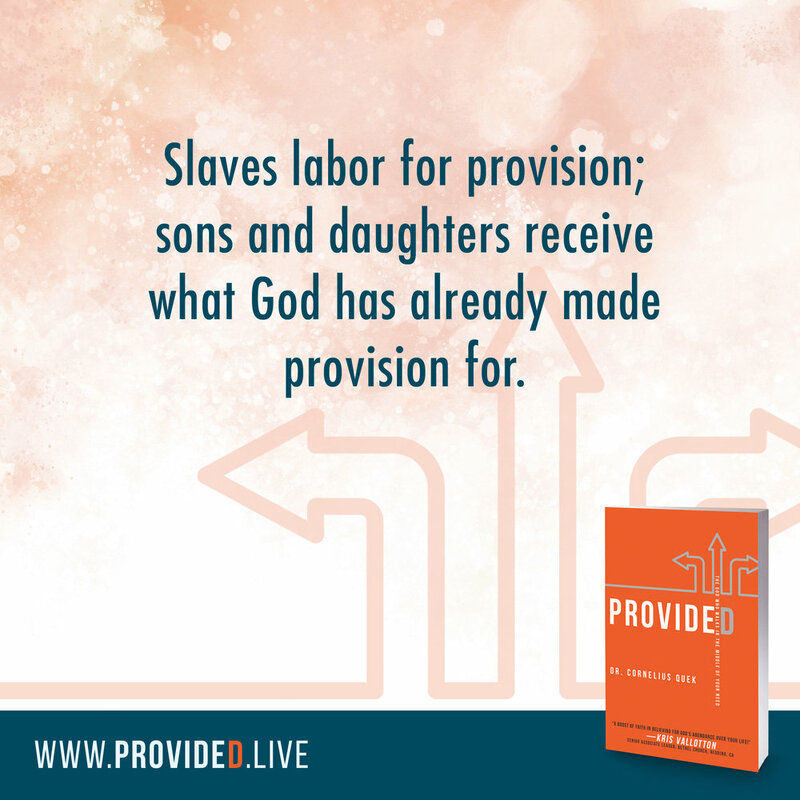 The biblical keys, prayers, and declarations in each chapter will enable believers to experience God’s provision for themselves, right here, right now. “Provided: The God Who Walks In The Middle Of Your Need” is a bold and enlightening assault against the lack that we see in the world. Dr. Cornelius Quek’s passion shines through and inspires believers to trust God to provide for our needs, as well as the resources for the dreams and assignments He has put in our hearts. What I love about this book is that it’s written from a place of experience, so it carries breakthrough and an impartation into an abundant life. 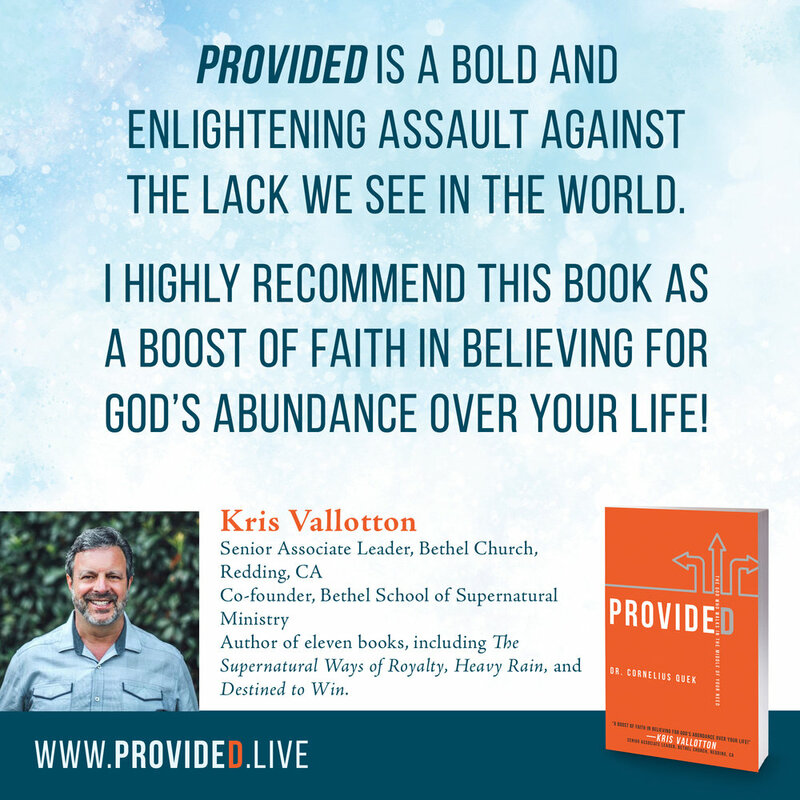 Whether you’re a missionary or a business person, just starting your journey with God or a veteran who’s been walking with Jesus for years, I highly recommend this book as a boost of faith in believing for God’s abundance over your life! 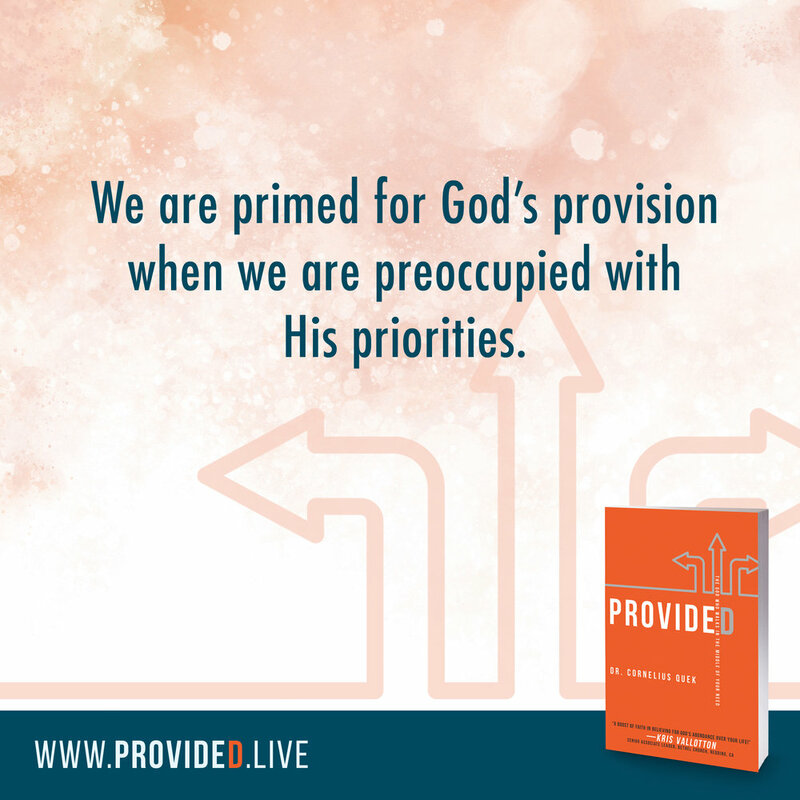 Many believers understand God to be the Provider but few experience His provision on a consistent basis. 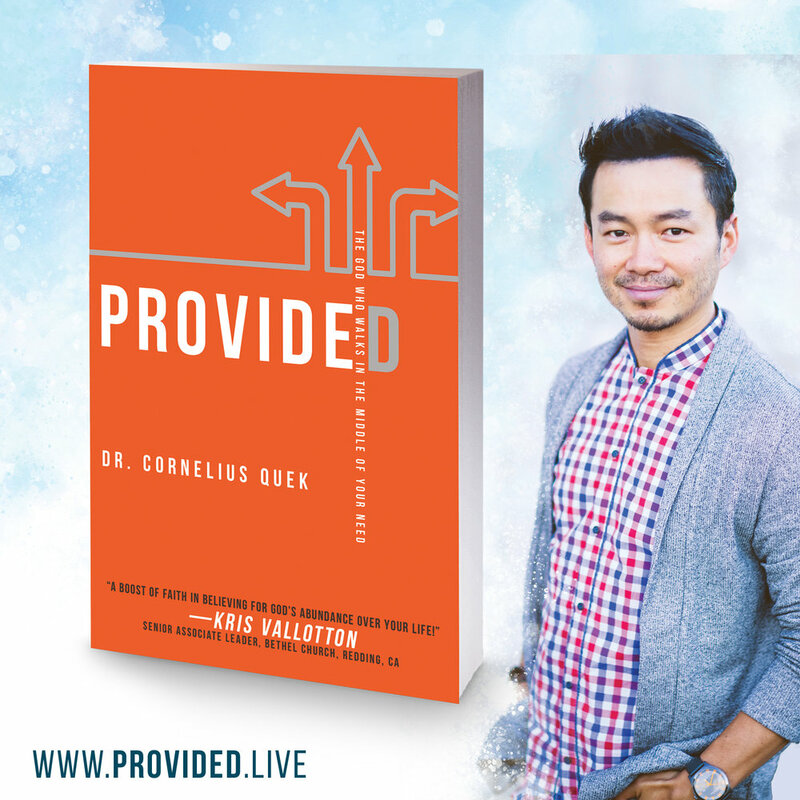 In "Provided," Dr. Cornelius Quek delivers a knockout punch to the spirit of lack over our lives! With sound biblical teaching and practical applications, he shows us how to tap into the magnanimity of the Father’s heart and receive His provision for all our needs and for the God-given dreams and destiny for our lives. The work of the kingdom will be accelerated if God’s people learned how to access the wealth of His resources. This is a timely prophetic message for the Body of Christ! "Provided" is more than a book about living in financial freedom; it is a book that can radically change mind-sets and set people free to step into a more abundant life that Jesus died for us to have. In the summer of 2013, a woman drove from Oakland to Redding (about three hours) to be a part of our 8 a.m. worship gathering at Destiny House. Toward the end of our meeting, we gathered around her to pray and prophesy over her. Cornelius released his prayers and anointing. A few days later, this woman informed us that $217,544.21 was forgiven off the principal of her home. This is just one of the many testimonies God has released through Cornelius’ prayers. I have seen this time and time again. - Jennifer A. Miskov, Ph.D.
Let me be blunt. If you want to learn how God loves you and how He operates in your life and the life of your friends and loved ones, this book by Dr. Cornelius Quek is the book for you. Dr. Cornelius has the unique gift and unparalleled anointing to “show God to you” through personal stories that are easy to understand and that show who God really is! God is so personal and you are about to learn that. I only wish someone had given me this book when I was much younger! Please get this book for yourself today and get another one for someone you truly care for. Neither of you will be sorry you did! Founder of 7K and Elisha’s Room, Dr. Cornelius Quek was born into a Buddhist family in Singapore. Even at a young age, he had an acute sense of spirituality. At sixteen years old, he encountered the love of Jesus, and his life was dramatically transformed. He was radically saved and delivered from temple and pagan idol worship. His father, out of sheer anger and desperation, sought out a temple medium, or fortune teller, to inquire about Cornelius. The temple medium told his father, “The Spirit that is on him, I have no power to touch.” Many years later, he experienced the great joy of leading his parents to the Lord. Cornelius received his theological training from London School of Theology in the United Kingdom. He also earned master of divinity and doctor of ministry degrees from the world-renowned Oral Roberts University, researching the ministry of the supernatural in the marketplace. He is a fruit of Oral Roberts University’s ministry to take God’s healing power into every man’s world. Cornelius is passionate about speaking to, equipping, and mentoring contemporary leaders and culture-makers to influence every sphere of society. He and his beautiful wife, Tiffany, have been commissioned by Bethel Church in Redding, California. He also teaches at Bethel Church and at the Bethel School of Supernatural Ministry. sign up and download the First Chapter free today!